I made a "Santa Maria"-style Tri-Tip over the weekend. It's a very flavorful BBQ somewhere between a true (tm) BBQ and a grilled meat item. 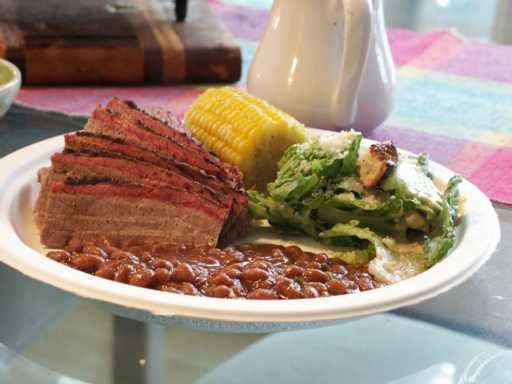 "This flavorful beef cut has been one of the beef industry's best kept secrets. Tri-tip was seldom marketed when carcass beef or beef quarters were delivered to retail markets because there are only two tri-tips per carcass. This meant that there was not enough for a case display. Consequently, the butcher would grind or cube it. Today, most stores receive boneless boxed beef. 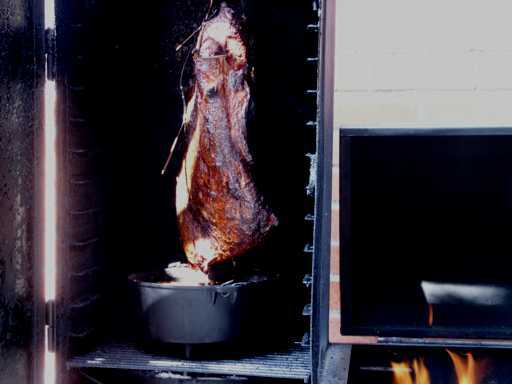 Tri-tip roasts will vary from 1 1/2 to 2 pounds and are about two inches thick." I say "Santa Maria"-style because apparently there's actually an AOC (Appellation d'Origine Contrôlée) that refers to very specific cooking methods and even (geez!) serving it with specific side dishes!. My method is to rub the tri-tip with a basic BBQ rub and let it sit for around an hour. I then grill it fat side down for 5 minutes, then place it offset in the cooker and cook for 30-45 minutes or until medium-rare. I use heavy smoke (pecan this time) since it isn't on the smoke for all that long. Rest for 20 minutes and slice thin. I served it on toasted buns with a honey-hot BBQ sauce and cheese. The non-official side dish was a potato salad made with new potatoes, bacon, celery, mustard, and vinegar, thickened by a mayo made from bacon fat and an egg. Sort of half-way between an "American" and "German" style. I'm cleaning up the side-cabinet in the kitchen where I normally tape recipes and ideas that I'm working on. I didn't want to lose the details of my normal bean "recipe" even though by now I've pretty much memorized it. Originally from William. 7) Place in smoker underneath BBQing meats, uncovered for 2-3 hours. Add more liquid if needed to keep beans slightly covered. However, allow the mixture to thicken/reduce. Stir every once in a while. 8) There will likely be a layer of grease on the top of the beans. Stir this in during cooking, but don't do so at the end. Lay several paper towels on the top of the beans to soak it up and remove. Stir one final time. This week's Good Eats features Alton Brown talking about making stock. If you've got FoodTV, be sure to try to catch it. He pretty much lines up with what I have to say about stock (it's about the biggest bang for the buck you can do to improve your cooking) and how to go about making it. He also features a rather clever approach to draining the stock (use of a steamer basket). He uses slightly less meat per pound of water than I do. And I don't generally add garlic to my stock, but other than that I really can't argue with any of his ideas. I sort of wish that he had mentioned that the basics also apply to other kinds of stock -- he focuses on chicken stock for this episode. This is fine because I think most people are going to be able to easily get chicken. Unfortunately, while one can get decent chicken stock in cans, the same cannot be said for beef stock. If you haven't been reading or heard of (where have you been? Under a rock?) The Julie/Julia Project, check it out. She's 26 days from finishing cooking every single recipe in Mastering the Art of French Cooking, Volume One. She just got done with the brains. Mmmmmm. Brains. Today I did a BBQ brisket. I'm tried a new method, hanging the brisket up in the smoker rather than laying it flat. I had seen this on some cooking show and am always looking for an excuse to try something new because it means I get to use the BBQ. Also, Michael has returned from his summer vacation, so Carol and I are having a BBQ in his honor. The brisket, as you'll find it in the store. It's either referred to as "untrimmed" or "packer cut" (as of this writing, $1.51 per lb). 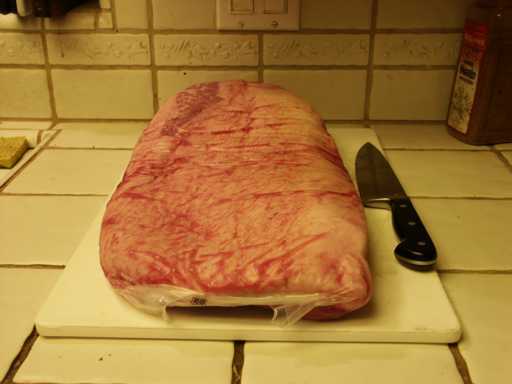 This brisket was 11.21 pounds. You can see a chef's knife with an 8 inch blade for size reference. Notice that the top of the brisket is almost entirely covered in a 1/4 to 1/2 inch layer of fat. 6 AM. 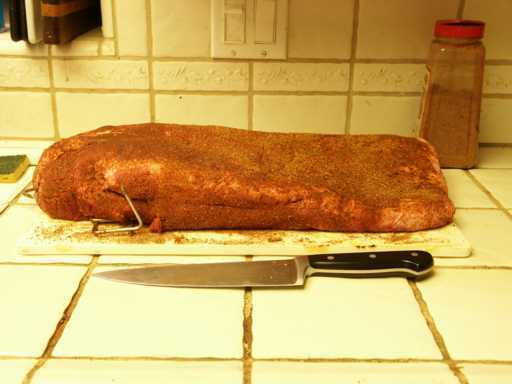 Here's the brisket, rubbed with my standard BBQ rub and attached to a bacon hook. It's ready for the BBQ. Here's the smoker with the fire at "ready to cook" temperatures and the brisket in the smoker. 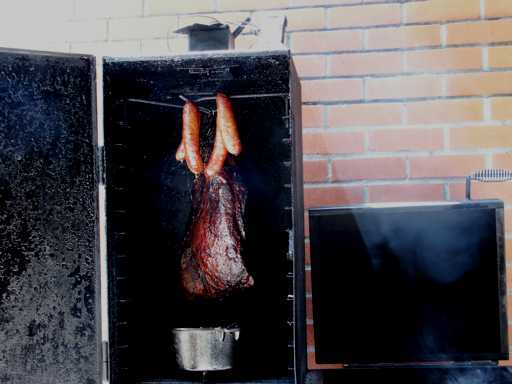 As you can see, hanging a brisket has one huge disadvantage in that it takes up a good amount of the smoker. It does look like I could fit a total of four briskets in, however. You can probably also just make out the two temperature probes. These run up and out the top vent of the smoker to a remote transmitter. I can check the temperatures while remaining in the house. 142 and 135 degrees in the middle and top of the smoke chamber. 7 AM. Put together the beans (which will go on the fire later), sauce, and Ceasar Salad dressing. Made croutons. 251 and 257 degrees -- trying to keep the temperature between 250 and 275. 8 AM. Internal meat temperature 140-150 on the flat. Smoke chamber 249 and 240. Restoked the fire and placed the beans in the smoker. I'm using a combination of mesquite lump charcoal and small split logs of almond wood. Note that during the cooking the firebox lid is shut -- I've just got it open to get the bed of coals re-started. 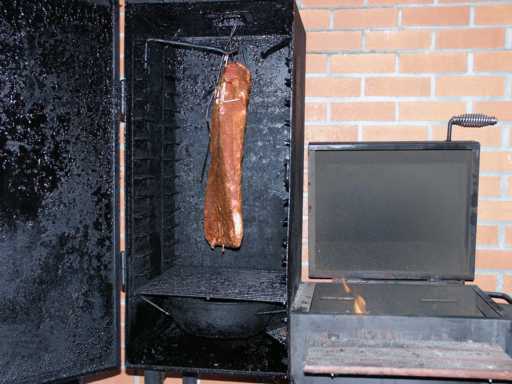 The meat has been cooking for just over 4 hours now. You may be able to tell how much it has shrunk already. Note that the juices and fat from the meat will be directly dripping into the bean pot. 11 AM. Internal meat temperature 160 on the flat. Smoke chamber 250 and 255. I've got sausages hanging in the smoker now, they should be done in another hour or so. Meat's been smoking now for just over 7 hours. I expect another two hours or so before we can eat it. 2 PM. Pulled the meat after 9 hours -- it had hit 170-180, which isn't really fully done for brisket. Let it rest for about half an hour and then carved it. Could have used more time, but we were all hungry. Did have a pretty good smoke ring on it (that's the red/pink you see on what is actually the outside of the meat), and it certainly tasted great. The experiment works! 5 PM.